Geo-data in Drupal is commonly represented with the Geofield module, which can store points, lines and polygons. You can add a geofield to your content profile, user profile or custom entity, and the user can either pick a location from the map or directly input latitude and longitude. A more user-friendly alternative is to use the addressfield-geofield combination: using the excellent Geocoder module any address field (provided by the Addressfield module) can be geo-coded and stored in a geofield. The module can use Google, Yahoo, or any other custom geocoder to turn user-entered addresses into geographical coordinates. 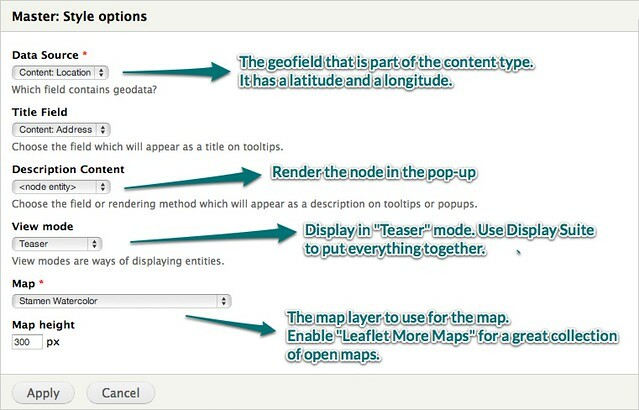 Once your geo-data is stored in Drupal, Leaflet offers you two ways to display that data: as a field formatter or using Views. The first approach is great for displaying a map for a single entity, such as a map for a user profile or an event node with a location, while the second approach is perfect for showing a map of multiple entities. To use Views to display geo-data, enable the Leaflet Views submodule, part of the Leaflet module. Create a new View of your entities that contain the geodata, add the geofield to Fields, and select the Leaflet Map format. You can set a couple of options such as the fields to show up in the pop-up, or the height of the map (see the image). Configuration options of the Leaflet style in Views. If you are fond of Display Suite to display and style your content (who is not? ), then you probably want to style the Leaflet popups with a View mode. The Leaflet module provides a very neat integration for this. In "Description Content", select for example <node entity> (if you are mapping nodes and not other types of entities), and then pick the View mode to render the entity. For example, you could have a custom view mode Map for your entity that shows the title, a teaser view of your body, and a teaser image, and style it all via Display Suite without having to fiddle with Views. Building a nice map requires beautiful map tiles. Luckily, there are many beautiful and free tiles available on the web. The easiest way to use different layers on your map is to use the Leaflet More Maps module, which gives you maps from various providers such as Stamen, Mapbox or OpenStreetMap. If you however want full control over your map and its behavior (tiles, options for zooming, scrolling, popups etc. ), you can implement hook_leaflet_map_info in your custom module (see leaflet.api.php for more info on that). Development on the Leaflet module is happening quite fast, and many people are contributing excellent patches. See you in the issue queue!